Eye appealing food perpared fresh daily using local ingreafients! Golden Gate Foods concession booths are mainstays at biker events, fairs, music festivals, seafood festivals, and major art shows around the Country. Our menus are as varied as the events we attend. Our talented chefs create a sampling of seafood fare using fresh, local ingredients. 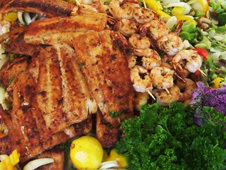 Crawfish, shrimp, grouper, tilapia, calamari, crab, and squid are fried and/or grilled fresh on-site and available for any events. Our corn dogs, chicken fingers, burgers, fries and funnel cakes are family fair pleasers. 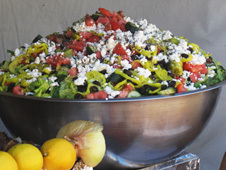 Our award winning Greek cuisine includes mouth-watering gyros, chicken divine, with sides of rice or tempting feta filled salads. We can cook to order almost anything, and our menu planners are skilled at designing a selection perfect and unique for your event. Here at Golden Gate Foods we are able to keep the lines moving and your patrons content. We are second to none in the way we service your customers. We employ experienced servers who serve freshly prepared food throughout the day and we serve it up quickly to your patrons. We have our own trained cooks, servers and set-up crews and can operate all our concessions without personnel support from the event. We really do make it easy for you. We secure all permits, insure compliance with health department and fire department rules and regulations, handle all inspections and secure all insurance certificates with additional insureds. Golden Gate Foods provides all tents, fences and signage for an eye popping, uniform appearance. We can also provide tents and seating for casual dining for your patrons. 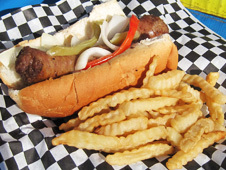 Golden Gate Foods has been serving up delicious food at outdoor events across all corners of the United States for over 25 years. Whether you are hosting an event for a few thousand people or are expecting tens of thousands of daily patrons our experienced staff will efficiently serve the highest quality food from our concession locations throughout your event. We can set up a single location, multiple locations or be the exclusive food provider at your event. We are credit card friendly and with our affiliate, Golden Gate ATM, can provide mobile ATM machines for the convenience of your patrons.